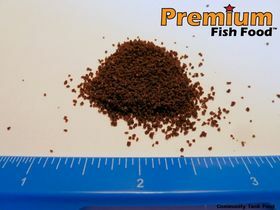 Community tank foods are designed to deliver the nutrients most community tank fish require. These foods are the perfect staple diet for your various tank inhabitants. This is a small crumble. About half will float and half will sink, which allows all fish in the aquarium to access the food. Extremely high in protein and essential vitamins and minerals, this food will keep your fish healthy and colorful. Feed fish only as much as they will consume within 5-10 minutes. Do not overfeed. Food will not cloud water or impact water quality if used properly.